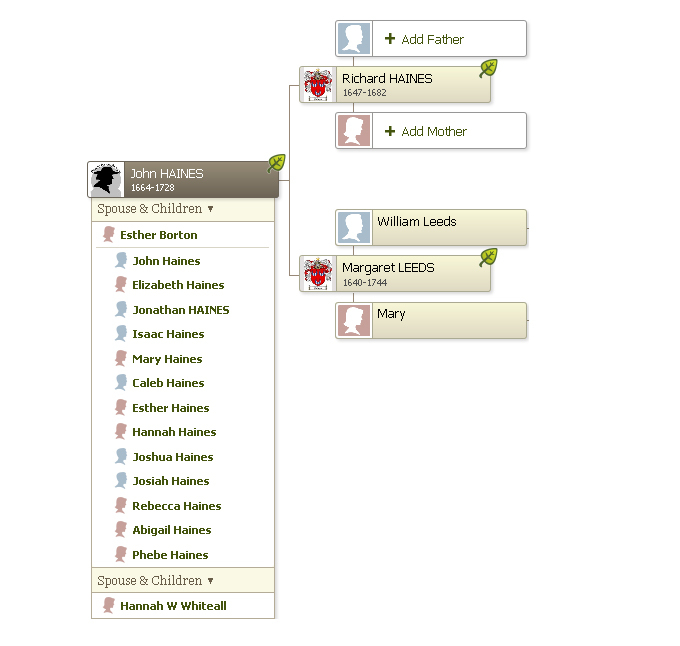 John Haines, eldest son of Richard and Margaret Haines, was born in 1664 and died in 1728. He married twice, in 1684 to Esther Borton and in 1722 to Hannah Whitehall Wood (widow of Wood). 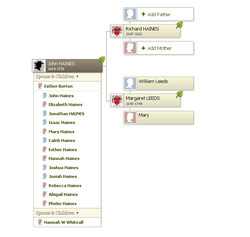 His birth and baptism were not recorded in Aynhoe but his younger brother Richard's was leading to unproved assumptions that John was not born in Ayho but moved there with his parents as an infant. John became a member of the Religious Society of Friends along with his parents sometime between 1672 and 1676. In 1679, when he was about 15 years old, John "removed" (moved) to West Jersey with the family of John Borton, who also lived in Aynho. They probably sailed on the Griffith. For the record, there were other Quakers named John Haines (with the usual spelling variations) living in England and suffering for their faith. Besse lists a John Haines in Faringdon, and a John Haines in Watchfield, Berkshire, both in 1685. Neither are our young man, who was living in the Delaware Valley by this time. It is unknown of the relationship of these Haineses. It is said he wrote to his parents with tales of how wonderful the land was in West Jersey and that he lived at first in a cave on "Haines Bank." 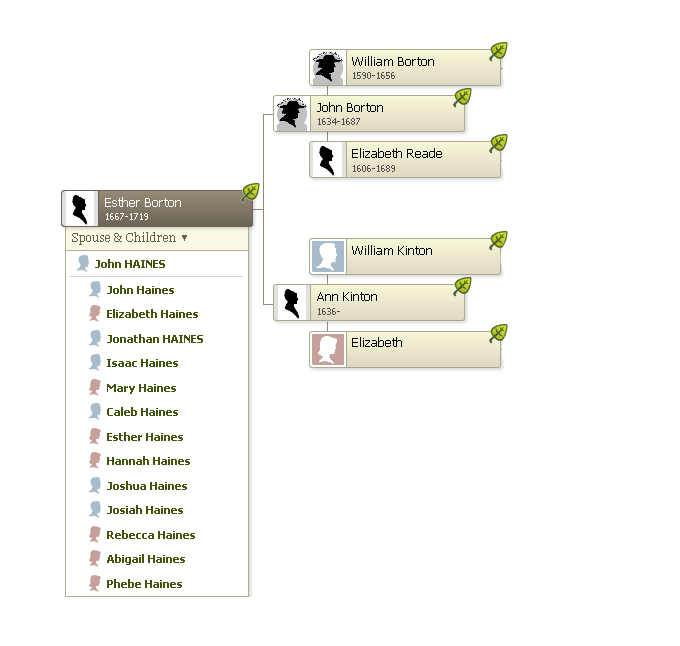 John married first Esther Borton, the daughter of John Borton and Ann Kinton, on 10 Dec 1684 at the Burlington Meeting House when he was 20 and she was 17. John and Esther had 13 children together. John was a farmer, and gradually became a large landowner. The first recorded survey of land was dated 1683. In 1687 he purchased 100 acres from Percival Towle. He purchased 100 acres on the south side of the Rancocas Creek in 12th month 1691/2. In 1693 he purchased 200 acres from the executors of Thomas Olive and 200 acres from Samuel Jennings. He bought 85 acres from his brother Thomas in 1694. Between 5th month and 11th month 1693 he became listed as "of Evesham Township", Burlington County, West Jersey. Esther died in 1719. John married for the second time in 1722 at Woodbury meeting house, under the care of Haddonfield Monthly Meeting, Hannah Whitall Wood, the widow of James Whithall and Henry Wood . John continued to make real estate purchases in New Jersey and Pennsylvania. In 1702 he bought 965 acres in Goshen Township, Chester County, Pennsylvania, from the estate of Pennsylvania Governor Thomas Lloyd. Today the city of West Chester south of Gay Street is on part of this land. Of this he conveyed to his son John 365 acres in 1715. John bought another 254 acres in Chester County in 1710. The next year he joined Richard HAINES, William HAINES, Thomas WILKINS, John Borton, Benjamin Moore (Moorestown is named for him), and Jonathan Haines to purchase a tract of 2240 acres of farm and wood land in southern New Jersey, named "Friendship Tract." John's will was dated November 4 and proved November 21, 1728. It mentioned his "now wife" Hannah and nine surviving children. 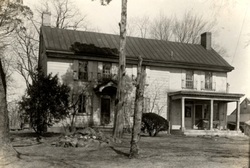 His real estate included the home farm, a saw mill and lot, a farm of 245 acres adjoining his brother Richard Haines, land at the Hay Landing, and land at Goshen bought of Isaac Norris and David Lloyd. He also had personal property inventoried at £362.4.0, including a servant boy whose remaining time was valued at £12. His son Jonathan and son-in-law Thomas Lippincott re named executors. The will was witnessed by William Haines, Mary Whiteall, and John Burr. Please note: When I say "unknown" below, that just means I haven't taken the time to look them up myself. 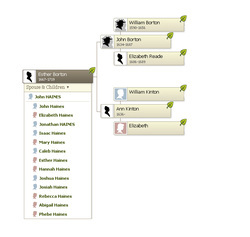 Others have some of the children listed on their trees in Ancestry. John Haines - 14 Dec 1685 - ? Hannah Haines - 13 Feb 1699 - ? Josiah Haines - 1703 - ? This farmhouse is the oldest home in Medford Township and it is the earliest frame dwelling in Burlington County still on its original stone foundation. It was built on land patented to the builder's father, Richard Haines, by the Duke of York (later King James II) on April 21, 1682. The west side of the house is the earliest section, built by John Haines prior to 1690. His son, Jonathan Haines (1), added the east section in 1720. Another Haines "modernized" it in 1808 and still another Haines added a wraparound section circa 1840. The property remained in the Haines family until 1919. A direct descendant of John Haines purchased the farm in 1972. Two different owners have seen a "resident ghost." The home was listed on the New Jersey and National Registers of Historic Places in June 1976.